Emilia Romagna is not necessarily known for its bread abroad, yet in Italy, there are some areas that have an excellent offering. Ferrara, for example, is well-known for the quality of its bread in general, the Romagna area for its piadine (a large round flat-bread often made with lard), Bologna and Modena for their Crescentine (square/rectangular deep fried bread cushions) and Tigelle (small round leavened flatbread). As with every item of Italian food, bread is considered to serve a purpose. It’s not just a meal filler, but certain breads, such as Piadina, Cresentina and Tigella) can be a meal in themselves when served with the Region’s various cheeses and cured meats. When I first came to Bologna many years ago, I was a little disappointed with the bread that was traditionally served at the table (the most popular being a ‘Crocetta’) with the incredibly rich and tasty foods. Why is the food so tasty and the bread so dry and tasteless? Having been brought up with a German mother, good, tasty, multi-grain and wholemeal bread was always a must in our house. Of course, it didn’t take long for it all to make sense. It is the food that is the protagonist and not the bread – and here we mean the typical ‘crocetta’ served with a plate of Tagliatelle al Ragù. It wouldn’t make sense to serve nonna’s home-made, handmade Tortellini in broth, or Lasagne alla Bolognese, or Tortelloni with Ricotta and Spinach and cover those oh-so-wonderful flavours with the taste of the bread. The bread in Emilia Romagna has various functions. 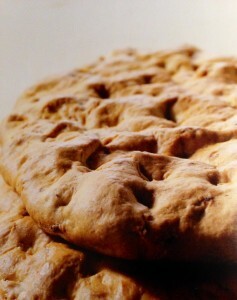 There are those breads such as Tigelle, Crescentine and Piadine (see our ‘Breads of Emilia Romagna course’ http://www.yummy-italy.com/yummy-cookery-courses/breads-of-emilia-romagna.html) that are tasty, but not overpowering and exalt all those local specialities that are served with them – Prosciutto di Parma, Mortadella, Coppa, Pecorino and Parmesan cheeses. Then there is the protagonists of all protagonists, the Crescente Bolognese. The Crescente bolognese is a typical, very tasty, Bolognese bread which was once considered the ‘poor man’s food’. Farmers and manual labourers often ate Crescente as their lunchtime meal. Originally, Crescente was made with pieces of slightly rancid Prosciutto or other old cured meats that were not suitable to be eaten as they were. In order to make it even tastier, water, in which a ‘cotechino’ (a kind of cooked pork sausage) had been boiled, was often added. The top was sprinkled with small pieces of ‘cotica’ or pig skin which, when baked, curled up and became crunchy and added to the rich flavour. Today, Crescente is often made with pieces of Mortadella or Salami as an alternative to Prosciutto Crudo or Pancetta. Yummy Italy proposes a modern version of this bread found in every baker in the region, each of who has his/her own recipe. Dilute the yeast in 50ml of lukewarm water (of the 250ml) and add the sugar until it dissolves. Heap the flour on your work surface, make a well and add all the ingredients, including the water with the yeast and sugar. Knead quickly – the dough must not be too smooth, make a ball, cover and leave to rise for about an hour. After the dough has risen, roll it out (do not knead again), forming an oval shape of about 1,5cm in height. Place on a baking tray, make holes all over the dough with a fork. You can also score the top into diamond shapes with a sharp knife or razor-blade if you wish. Brush with a beaten egg and leave to rise again, preferably in a warm place for another 50 minutes, or until it has almost doubled its original size. If you prefer it a little more spongey, leave to rise until it has completely doubled in size. When it is ready, the scored lines will be rounded and slightly open. Bake in a pre-heated oven for 40-45 minutes. Eat on it’s own or as a sandwich with cured meats. Yummy. Oh, and don’t forget a glass or two of good quality, chilled Lambrusco! Obsessed with fine food, admirer of beautiful cars, mother of one child and two cats and cake baker for friends. I have been living in the Bolognese hills for 15 years and have fallen in love with everything that defines Emilia Romagna....and its wonderful food.